One of our favorite things to do at Disqus is talk with publishers about how we can help them grow. Frequently publishers tell us about their desires to grow their email subscription lists as a way to distribute their content directly with their readers. We took these insights and turned them into a new feature within Disqus. 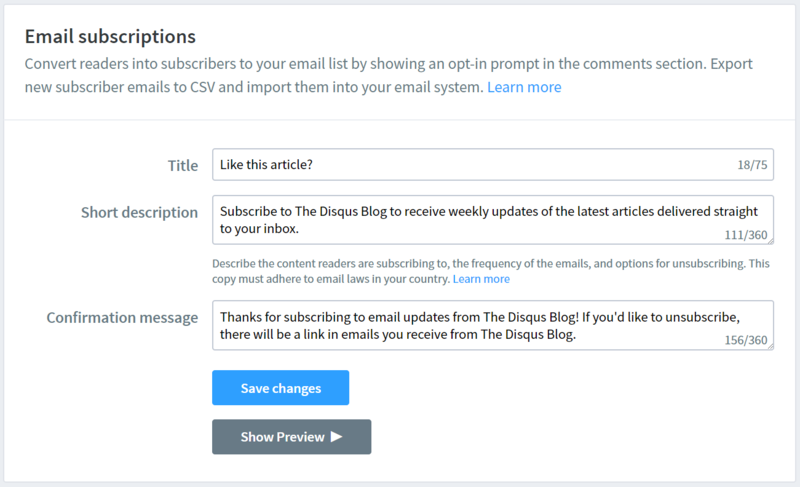 Starting today, publishers on our Disqus Pro and Business plans can now enable an email subscription prompt directly within the Disqus comment embed to allow their most engaged users to seamlessly subscribe. Creating great content is just one piece of a successful strategy. Getting that content in the hands, on the screens, and in the minds of readers is critical. For today's digital publishers, this can be especially challenging. With search algorithms and social feeds controlling what content reaches which audiences, publishers are often left scrambling to keep up. In response, publishers are increasingly investing in building direct relationships with their readers rather than fighting for clicks on social platforms. This means an increased focus on capturing emails from readers and delivering engaging content that keeps those readers coming back for more. With email, publishers can deliver content to their audiences directly. This means more control for publishers, less variability in readership, and increased autonomy from third party influence. We believe that publishers, not social media platforms, should own the relationships with their readers. Our goal is to help publishers own that relationship by providing tools that help them develop stronger, more direct relationships with their readers. The email subscription prompt appears below the comment box and enables readers to seamlessly opt-in to emails from publishers. By leveraging some of the most engaged real estate on the page, publishers now have a new avenue for growing their email lists and converting their most engaged readers into email subscribers. For readers that already have Disqus accounts or are logged-in using one of our social sign in options, subscribing is an easy, one-click experience. Everyone else will see a form field where they can enter an email address. To verify these email addresses and avoid spam and other fraudulent entries, Disqus will send a confirmation email to users who subscribe. 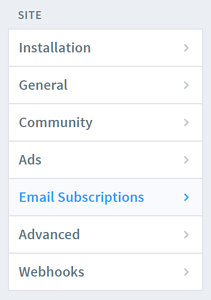 Publishers can enable the email subscription prompt from the new Email Subscriptions settings page within the admin panel. We know that the types and frequency of email communications that publishers use will vary from site to site. To ensure the best experience for readers, publishers can customize the title, description and confirmation copy from their settings page. Publishers should be transparent in this copy about the types and frequency of emails that readers will receive if they opt-in. Additionally from the Email Subscriptions page, publishers can export all of their subscribed users as a pre-formatted CSV that easily imports into any popular email marketing provider such as Mailchimp and Constant Contact. For more information on getting started, check out our implementation guide and FAQ. We’re excited to help publishers grow their subscriber bases. Going forward our intention is to continue to deliver new and expanded methods for publishers to engage with and better understand their audiences. Currently we are in the process of updating Disqus’ Audience Analytics to provide additional insights for publishers about their audiences to help them identify and interact with their most engaged readers. We also aim to add browser notifications as an additional distribution channel for publishers in the future.